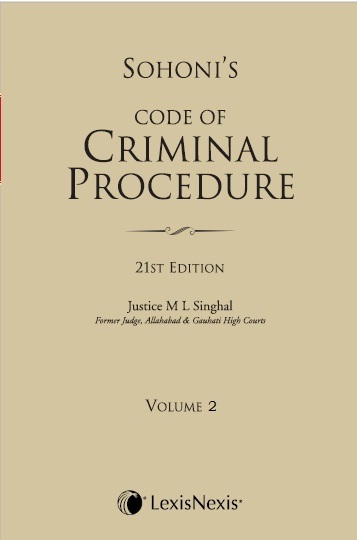 Sohoni’s Code of Criminal Procedure is the most comprehensive and authoritative work on the Law of Criminal Procedure in India. It is a section wise commentary on the Code and follows the scheme of the bare Act. Comprehensiveness, authoritativeness, lucidity of expression, clear exposition of law and its systematic arrangement distinguish this legal classic from other books on the subject. This Twenty-first edition (in 5 Volumes) incorporates up-to-date Central and State Amendments including the changes made by the Criminal Law (Amendment) Act, 2013 (Act 13 of 2013), the Code of Criminal Procedure (Amendment) Act, 2010 (Act 41 of 2010) and the Code of Criminal Procedure (Amendment) Act, 2008 (Act 5 of 2009). All latest notable decisions of the Supreme Court and various High Courts reported in leading reporters such as All India Reporter, Criminal Law Journal, Supreme Court Cases, Supreme Court Cases (Cri), Supreme Court Weekly, Supreme, Crimes, All India Cases, SCALE, Allahabad Criminal Cases, Allahabad Law Journal, Andhra Law Times, Gauhati Law Reports, Bombay Cases Reporter, Maharashtra Law Journal, Calcutta Law Journal, Eastern India Criminal Cases, Cuttack Law Times, Madras Law Journal, Karnataka Law Journal, Kerala Law Times, Gujarat Law Reporter, Jharkhand Cases Reporter, Delhi Law Times, Rajasthan Law Weekly, Patna Law Journal, Punjab Law Reporter, Madhya Pradesh Law Journal and other premier Law Reports of the country have been incorporated and discussed at appropriate places in the book. This work is an essential reference for Judges, Lawyers, prosecutors, Police Officers, Administrators, Academicians, and Research Scholars.